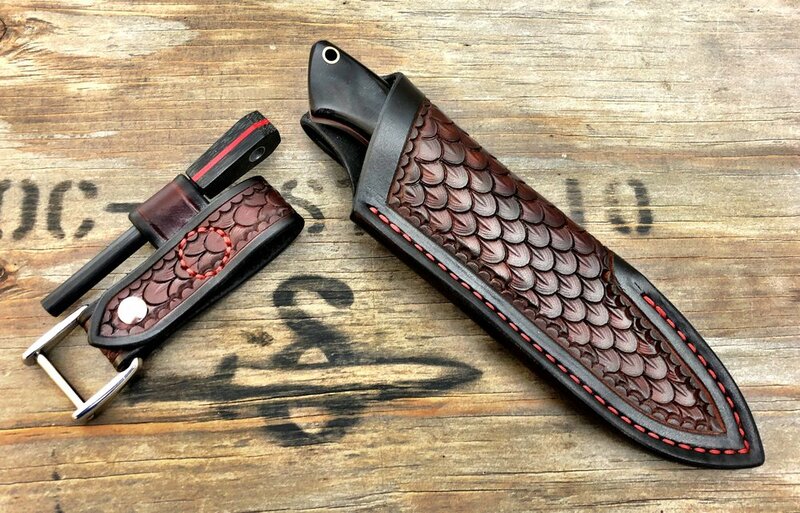 Drawing on over 10 years of custom sheath making experience, Diomedes Industries can make you a truly custom sheath for your blade. Please look below at some of the most recent custom sheaths, but do not allow the sample work to restrict your imagination. Dream it and let's make it. This sheath and belt system was made for Dr. Nicole Apelian and can be seen on this season of Alone on the History Channel. Nicole had a custom Bolo / Kukuri blade that she needed a special sheath for. This pancake style sheath has a 3/4 opening at the top and a closure that allows her to either slide the knife out without opening - or open the closure to allow for an easier removal. The belt has a hand made cold forged buckle a lot of extra length to go around her parka. Please see the Partners Page on this website to learn more about Dr. Apelian. This sheath and baldric system was made for Melissa Miller and can be seen on this season of Naked and Afraid on the Discovery Channel. Melissa had some special challenges on this show being without any gear or clothing so a special carry system was in order. We made her an extra long baldric strap and carry system (in the Paul Long style) so that she could wear the knife in any situation and use the baldric straps to her advantage while in the bush. Please see the Partners Page on this website to learn more about Melissa Miller. This blade was sent to me in very rough shape by a loving grandson who wanted something special for his grandfathers knife. This knife was carried in the skies in WWII and it needed a new sheath desperately. 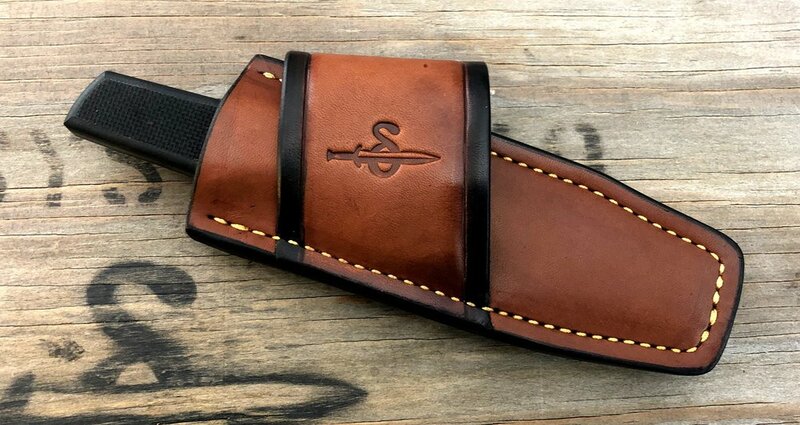 This one is a three pancake style lined sheath with a Sam Brown Stud on the front, custom dyed and designed. 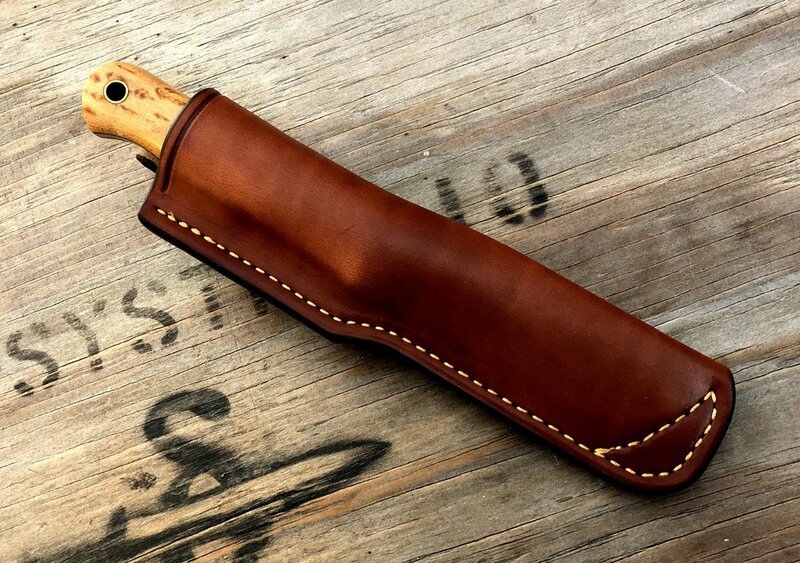 This sheath was made for an EDC knife for Melissa Miller. 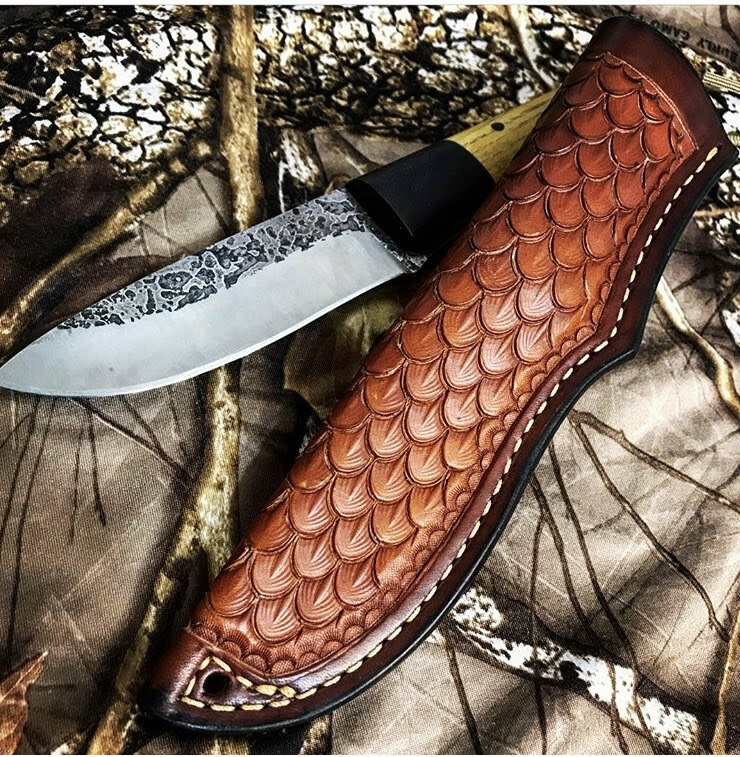 I laid in some dragon scales and made a custom outline on this sheath to compliment the Fiddleback Drop Point Renegade Andy Roy made for it. Sometimes customers dream up something and send you a pile of stuff and say "Make me a case that carries all this - and I want to carry it horizontally!" This was this case. A Leatherman and a flashlight, a belt and a dream. A few days later we had a fully lined pouch case with a loop for the flashlight that carries horizontally on the customers back. A custom hand sewn sheath for a Stanley Buzek knife (sbuzekknives.angelfire.com) The customer wanted a Paul Long style carry with a basketweave front. I think we got that done for her. This knife was an early one by Matt Helm, and great maker out of Texas, that he wanted a cross carry made for his father. After some discussion and a little prototyping - I think we got it done for him. A customer sent me a AA Forge kniffe to make a simple Alan Wood Style sheath for. Simple is often hard, and AA Forge has a Classic Bushcrafter that is very simple - and an amazing knife. This deep pouch carry will keep things secure and safe in the brush. I ground this Bark River Gunny in Ebony last year at Bark River's factory in Escanaba Michigan. I felt it needed a special sheath. Dragon scales and hand stitching did the trick. Another Bark River get's pants with this Butterfly tripled colored sheath and removable firesteel dangler combo.